An organization is a collection of people who work together to attain specified objectives. There are two types of organization structure, that can be formal organization and informal organization. An organisation is said to be formal organisation when the two or more than two persons come together to accomplish a common objective, and they follow a formal relationship, rules, and policies are established for compliance, and there exists a system of authority. On the other end, there is an informal organisation which is formed under the formal organisation as a system of social relationship, which comes into existence when people in an organisation, meet, interact and associate with each other. In this article excerpt, we are going to discuss the major differences between formal and informal organisation. Meaning An organization type in which the job of each member is clearly defined, whose authority, responsibility and accountability are fixed is formal organization. An organization formed within the formal organization as a network of interpersonal relationship, when people interact with each other, is known as informal communication. Creation Deliberately by top management. Spontaneously by members. Purpose To fulfill, the ultimate objective of the organization. To satisfy their social and psychological needs. Authority Members are bound by hierarchical structure. All members are equal. By the term formal organisation, we mean a structure that comes into existence when two or more people come together for a common purpose, and there is a legal & formal relationship between them. The formation of such an organisation is deliberate by the top level management. The organisation has its own set of rules, regulations, and policies expressed in writing. The basic objective of the establishment of an organisation is the attainment of the organisation’s goal. For this purpose, work is assigned, and authorities are delegated to each member and the concept of division of labour and specialisation of workers are applied and so the work is assigned on the basis of their capabilities. The job of each is fixed, and roles, responsibilities, authority and accountability associated with the job is clearly defined. In addition to this, there exists a hierarchical structure, which determines a logical authority relationship and follows a chain of command. The communication between two members is only through planned channels. An informal organisation is formed within the formal organisation; that is a system of interpersonal relationships between individuals working in an enterprise, that forms as a result of people meet, interact and associate with one another. The organisation is created by the members spontaneously, i.e. created out of socio-psychological needs and urge of people to talk. The organisation is featured by mutual aid, cooperation, and companionship among members. In an informal organisation, there are no defined channels of communication, and so members can interact with other members freely. They work together in their individual capacities and not professional. There is no defined set of rules and regulations that govern the relationship between members. Instead, it is a set of social norms, connections, and interaction. The organisation is personal i.e. no rules and regulations are imposed on them, their opinions, feelings, and views are given respect. However, it is temporary in nature, and it does not last long. Formal Organization is an organisation in which job of each member is clearly defined, whose authority, responsibility and accountability are fixed. Informal Organization is formed within the formal organisation as a network of interpersonal relationship when people interact with each other. Formal organisation is created deliberately by top management. Conversely, informal organisation is formed spontaneously by members. Formal organisation is aimed at fulfilling organisation’s objectives. As opposed to an informal organisation is created to satisfy their social and psychological needs. Formal organisation is permanent in nature; it continues for a long time. On the other hand, informal organisation is temporary in nature. The formal organisation follows official communication, i.e. the channels of communication are pre-defined. Unlike informal organisation, the communication flows in any direction. In the formal organisation, the rules and regulations are supposed to be followed by every member. In contrast to informal communication, there are norms, values, and beliefs, that work as a control mechanism. In the formal organisation, the focus is on the performance of work while in the case of an informal organisation, interpersonal communication is given more emphasis. The size of a formal organisation keeps on increasing, whereas the size of the informal organisation is small. 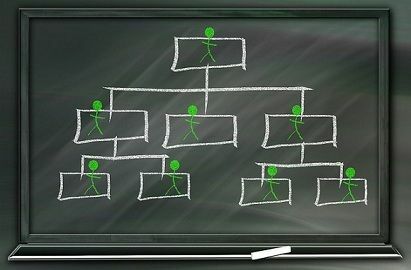 In a formal organisation, all the members are bound by the hierarchical structure, but all the members of an informal organisation are equal. An informal organisation is just opposite of a formal organisation. The principal difference between these two is that all the members of a formal organisation follow a chain of command, which is not in the case of an informal organisation. Moreover, there exists a superior-subordinate relationship (status relationship) in the former, whereas such relationship is absent in the latter because all the members are equal (role relationship).